explain how to assess your own gut health and understand how it impacts your bone health. The final two chapters are dedicated to food and exercise — the two major lifestyle keys to healthy bones. I picked up some good reminders for myself in these chapters — mainly to keep up a raw food/real food diet as much as possible, and to keep up daily exercise. 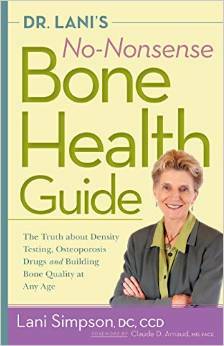 I found this book highly accessible and readily applicable to my own life experience and the questions I have about bone health. In particular, it helped me to understand some of the connections between how food is absorbed and bone is created and recreated in our bodies. I would recommend this book to anyone who is having back problems or is worried about their future bone health. This book will help you decide how to resolve your problem, and it will give you the information to ask much more detailed questions of the practitioners you may end up seeing for bone health.